South and North Korea have finalized their delegation lists for high-level inter-Korean talks scheduled Monday. According to the Ministry of Unification on Saturday, Minister Cho Myoung-gyon will lead the South Korean delegation that includes Vice Unification Minister Chun Hae-sung and two officials from the presidential office and the prime minister's office. The North Korean side is headed by Ri Son-gwon, chairman of the Committee for the Peaceful Reunification of the Country, which handles inter-Korean affairs. The committee's vice chairman will also attend as well as three other North Korean officials from state agencies related to railway transport, the environment and inter-Korean economic cooperation. 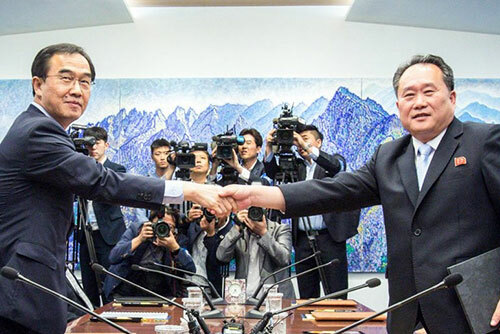 The two Koreas earlier agreed to hold a high-level meeting on Monday at the North's request on the northern side of the Panmunjeom border village. During the talks, the two sides will review the implementation of the April inter-Korean summit agreement and also discuss preparations for another summit between their leaders.